Announcing that a new baby coming is filled with excitement. We cannot wait for the baby to come. Wait we must, with joyful anticipation for the birth of a new child. Same thing with birthdays, we can’t seem to wait to celebrate someone else’s birthday. Wait we must, with gladness. I don’t mind waiting. For most of my life, I wait. Life consists mostly of waiting. The question is what do I do while I wait? The in-between-times. how do I respond to this? 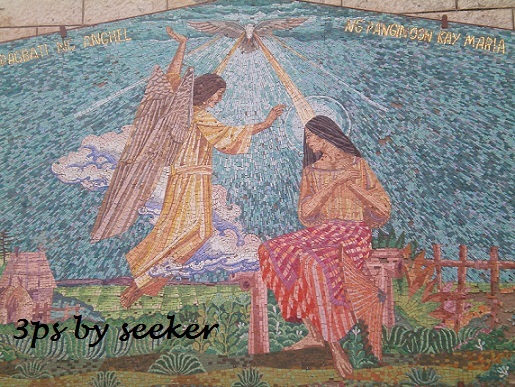 This photo is one of the many depictions of the Annunciation displayed in Bethlehem contributed by the Philippines. It’s an image of pure simplicity. Meditating on this photo with Mary in mind, she gladly accepted what was unacceptable. She said YES to conceive. What a courageous act. She waited with great understanding, anticipation and longing to fulfill her calling. As I reflected on this, my breathing slows down absorbing the joyful mystery. A one-minute-meditation, my mind and heart became pregnant with desire to be more intimate with Jesus Christ.